We fully understand that it’s stressful when things aren’t right, especially when you are living with the problem day to day. Our expert Customer Service and Claims teams are here to support you. 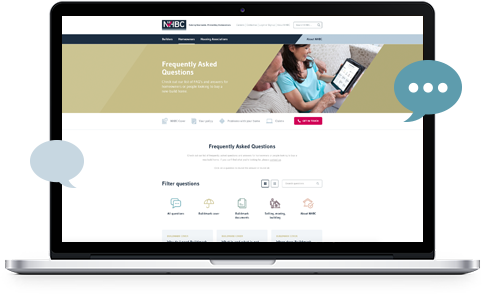 To work out how best we can help we need to check that you have an NHBC Buildmark policy for your home, how old the policy is and the nature of the problem you’re experiencing. Please follow the steps below to help us to help you. Step 1: Do you have NHBC Buildmark cover? If you already know that your home is covered by NHBC Buildmark, please skip straight to Step 2. If you’re not sure, the following information may help you decide. If you’re the first owner of a new build property, your builder and/or conveyancer should have confirmed if your home has NHBC Buildmark cover. You should have received a policy document and insurance certificate. Buildmark usually lasts for 10 years from the date the first owner completed their purchase of the property. It doesn't matter if you are not the first owner of the home. It's the home that's covered for 10 years. Cover is passed on to the new owner when the home is sold. If you are not the first owner of your home, it is possible that claims made by previous owners may have partially or wholly reduced the available financial limit for claims. Please contact our Claims team for further information. Very occasionally, if your home is a Housing Association property or part of a shared ownership scheme, it's possible that your home may even have 12 years' cover. If you have a problem with your home, you should report it to your landlord, managing agent or housing association in the first instance. Still not sure? Please contact us. We will be happy to check the status of the Buildmark cover on your home. Please select the scenario that best describes your situation for more information on how we can help. Please note, the information provided shows how Buildmark works in typical but not all circumstances. After you've exchanged contracts and accepted the Buildmark offer, your Buildmark policy protects you if you lose your deposit or have to pay more to complete the build of your home because your builder becomes insolvent or commits fraud. The most we will pay is 10% of the original purchase price or £100,000, whichever is lower. If your deposit was greater than this, you may not be fully protected. If you're worried about this, please contact us. For information about an existing claim, please complete our ongoing claim form and we will get back to you as quickly as we can. If you’d prefer to speak to us, please call our Claims team or request a call back. We're here Mon-Fri 8:30am to 5:30pm. If you have a problem with your home that’s covered by Buildmark and which you’ve raised in the first 2 years after the completion date (up to 3 years in the case of shared parts), your builder is responsible for putting it right within a reasonable time. This is called the builder warranty period. If your builder is not putting things right, or you've been unable to contact them, we offer a free resolution service to help with disputes about defects relating to the NHBC Standards. Please contact us if you’d like our help. Condensation and fine cracks in plaster aren’t usually building faults. New-build homes can contain up to 5,000 litres of water in the concrete, mortar, screed and plaster. The home needs to dry-out and, as it’s lived in and heated, water evaporates causing timber and plaster to shrink. This can cause small cracks to appear. You may also notice that you have condensation forming on cold surfaces such as windows. Modern homes are designed to minimise drafts and stop heat escaping but this can also stop water vapour escaping, leading to increased condensation. You can read "Your guide to condensation in your home" for more information. If you have severe condensation that you can’t control or major cracks that you’re concerned about, please contact us for advice. As an owner of a new home with Buildmark cover, you will have 10 years protection after legal completion. The first two years of cover is the builder warranty period, and any problems should be reported to the builder in the first instance. The eight years after this is the insurance period, during which you should contact NHBC. Please see What Does Buildmark Cover? for more information. From the expiry of the builder warranty period (usually 2 years after the completion date or up to 3 years for shared parts) until the expiry of your policy, Buildmark protects you if there is physical damage to certain structural parts of the home caused by the builder’s failure to meet the NHBC Requirements. You can see a summary of the cover we offer here. If you think there is physical damage to your home that is covered by Buildmark, please contact us, by starting a claim enquiry, or calling our Claims team. We always recommend that you read your Buildmark policy booklet and other documents to check the specific cover and any exclusions that apply to your home. If you can't find your policy booklet, and you know your policy number, you can download a copy here. If you can’t find your documents and you don’t know your policy number, please contact us. For an overview of Buildmark and what it covers please have a look at What does Buildmark cover? Buildmark Choice is our policy for landlords, and covers homes occupied by rental tenants and shared owners. Buildmark Choice usually covers a home for 10 years from the completion date (occasionally it’s 12 years). If you have problems with your home you should contact your landlord or managing agent. If your home is less than 2 years old your landlord or managing agent should contact the builder/contractor in the first instance. If your home is older than this your landlord should contact us. We're sorry we've not been able to answer your question here. Please contact us and our expert Customer Services team will be able to help you. We have a Frequently Asked Questions page that may provide additional information to help with your issue. The inspector was very professional, he took time to listen to me and he informed me clearly of what the process would be. He also told me that if I have any questions he is happy for me to call him anytime.